About Gisborne Glass Ltd - Your 100% Locally owned Glass Specialists! Gisborne Glass was established in 1982 and has serviced the Gisborne, East Coast and Wairoa areas for 32 years with Glass and Glazing Services. We are the first choice Local Qualified Glaziers with combined experience of over 60 years working with glass. STU AND THE TEAM: The people at Gisborne Glass (from left) Mase Finau, Caleb Craig, Rose Martin, Stu Smith, Asher Takao and Shaun Rogers. Stu Smith is passionate about Gisborne. He is passionate about the glass and glazing industry. And he is passionate about local businesses supporting the community; about local businesses being supported by local customers; about keeping profits in Gisborne and about fostering economic growth in this district. Stu is the managing director of Gisborne Glass Ltd — the longest serving locally-owned glass and glazing business in the Poverty Bay-East Coast region. Formed in 1982, Gisborne Glass Ltd are specialists across the spectrum of glass and glazing services. “We are independent glass merchants,” says Stu. “We are able to source the very best of hardware and glass types from various suppliers to best suit your requirements.” Stu’s team are available 24 hours a day, seven days a week to fix that broken window or help with your insurance claim. All repair work is carried out to the highest New Zealand glazing standards. Stu is always researching and developing new colours, textures and applications for glass splashbacks as he really wants to help you create the “wow” factor in your home. The team at Gisborne Glass comprises top class trade-qualified tradesmen and NZQA apprentices including Mase Finau who was recently named as New Zealand’s top apprentice for flat glass. 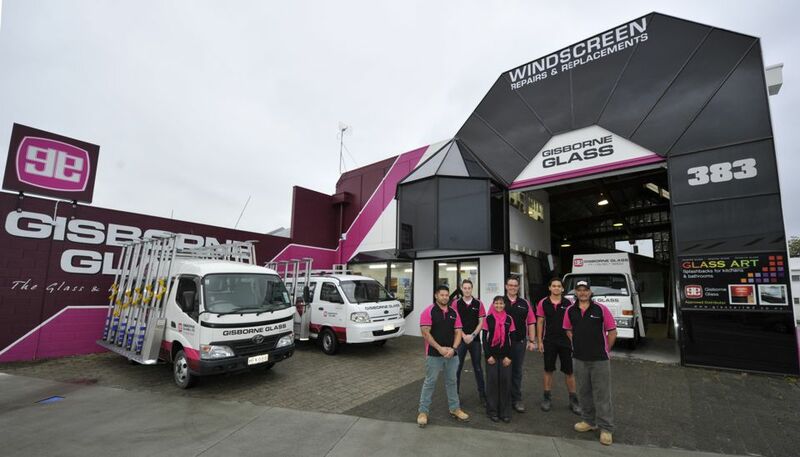 Gisborne Glass is the clear choice for many people in this region, being counted among the No 1 glaziers in New Zealand who consistently provide the best possible service at the best possible price. Although we may be looked upon as your friendly window repair man, our field of expertise goes far beyond the common old broken window. Your 100% Local Independent Windscreen Supplier with over 200 windscreens in stock. We have most modern vehicle glass ready and waiting for same day service. Images and painted glass splashbacks for kitchens, bathrooms and commercial applications.